There is a whats app group message screenshot that has been doing rounds on the internet and has cause a sensation among the KOT where a man by the name Ocholla Ochieng accidentally sent a bedroom message to a prayer group. The members of the group were shocked when they saw the text and the admin of the group couldnt believe what he saw. The screenshot somehow made its way to twitter where Ocholla was praised by team mafisi who branded him Mollis successor. 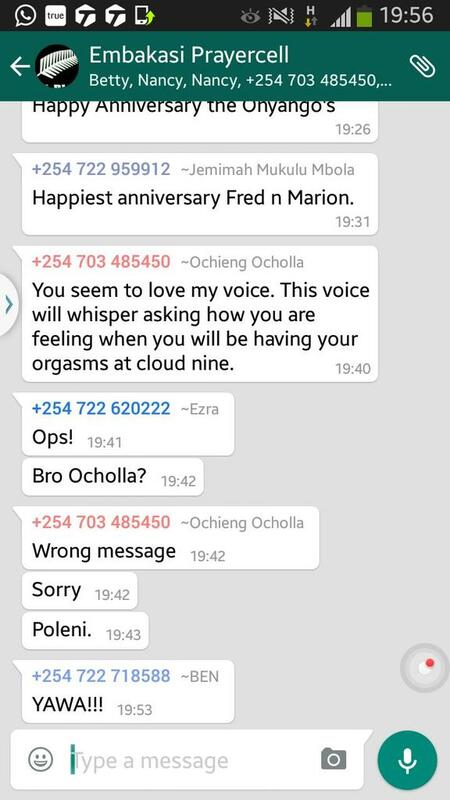 From the chat, you could tell that bro Ocholla thought he was sending it to a particular lady but alas! his itchy fingers could not place it where it was supposed to. The hashtag on twitter was so populated that condom manufacture Durext took the opportunity to advertise on it to capitalize on the huge market.